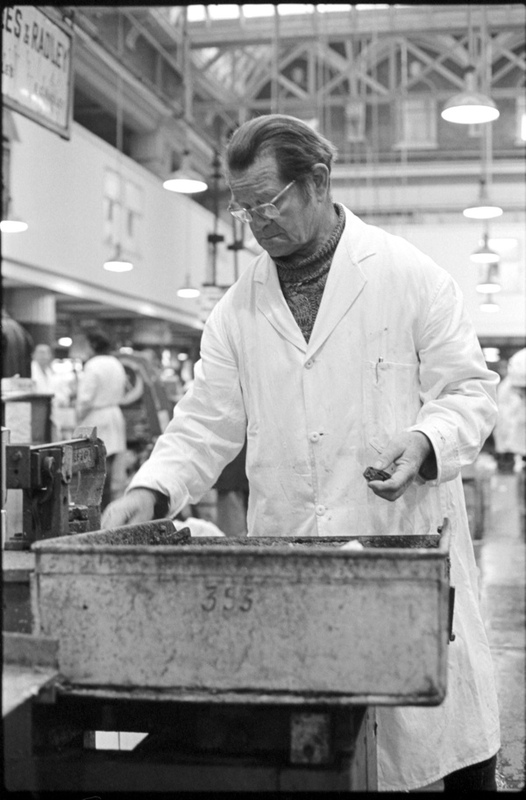 Great photos – What characters – they don’t make them like that anymore, do they? Great shots, thanks for showing them. 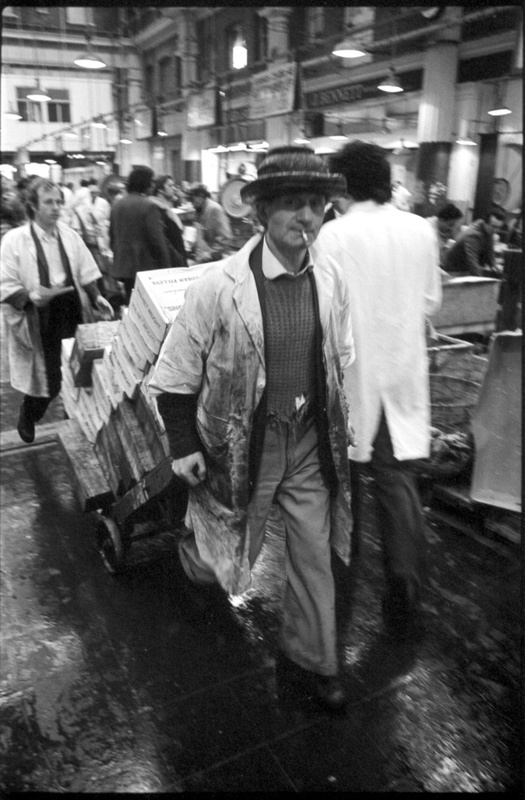 These are superb photographs, I have never been to Billingsgate Market but now, thanks to you GA and this photographer, I feel that I have experienced what it was like. I agree absolutely that characters like this seem to have gone forever which is so so sad, these were real men doing a real job. Are they conger eels that I spotted in one photo? 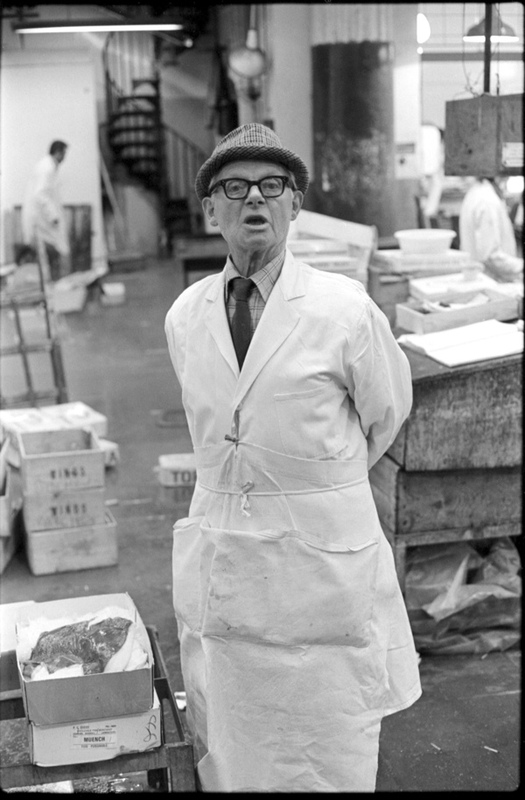 That brings back memories as my father loved conger eel which my mother cooked for us regularly, I haven’t had any now for years and this has made me realize just how much I miss it, a lovely dense texture and quite sweet tasting if I remember correctly. Brings back memories! 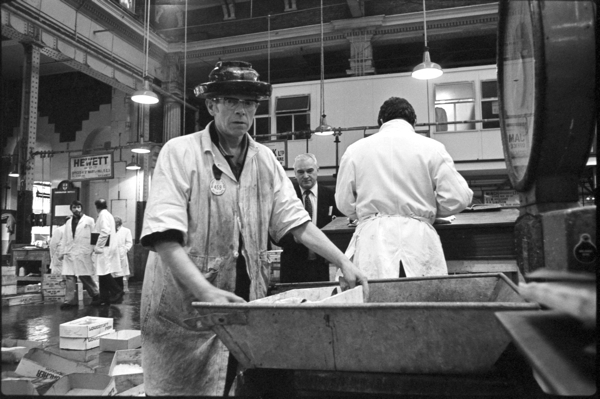 As a teenager, in the 1960s I worked in a lane just up the hill from Billingsgate. A very different world, going to work at 8.30am, walking past open pubs, the cafes, where you got huge portions of real food, the porters would have thrown anything less back! 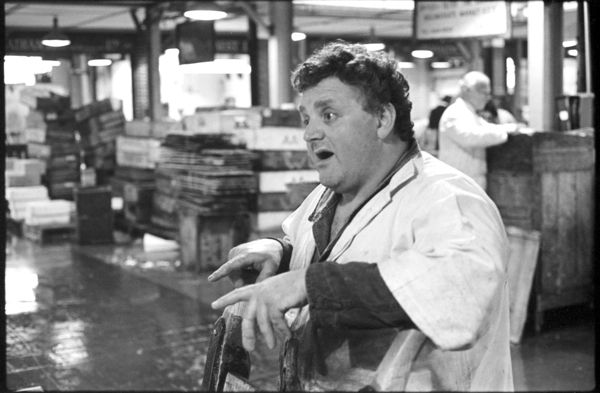 Also the buyers lorries could be parked anywhere in the area and many of the down and outs would sub-contract the porters work to push heavily laden barrows up the cobbled hills, soaked in water and fish slime! Wow are these great pictures!!!! 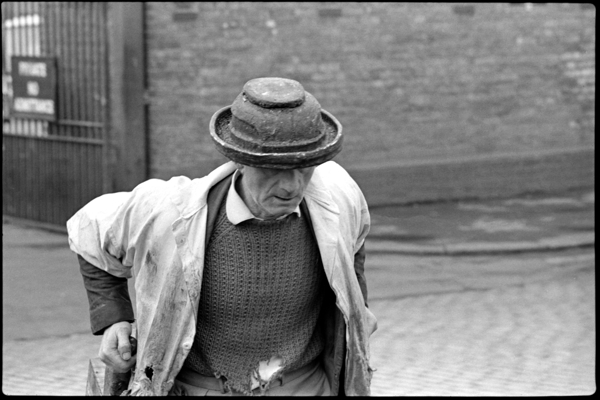 I love great b&w editorial photography, and these are first-rate. Thanks so much for posting these pictures. Terrific pictures. 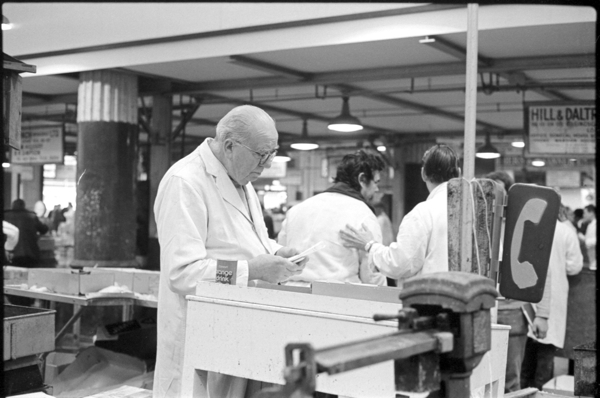 They vividly convey the place and the people working there . Great. 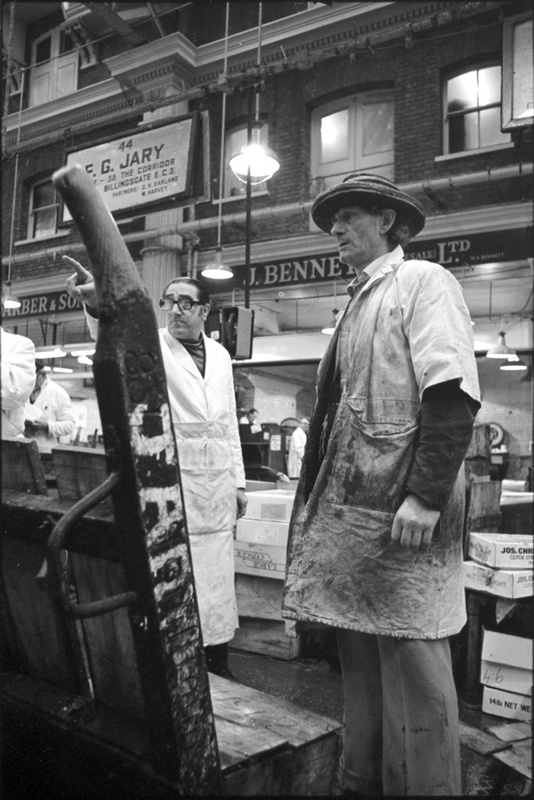 @Pauline – yes, they are conger eels (skinned – third photo down) and you can still get it occasionally from one of the fish stalls in Borough Market. 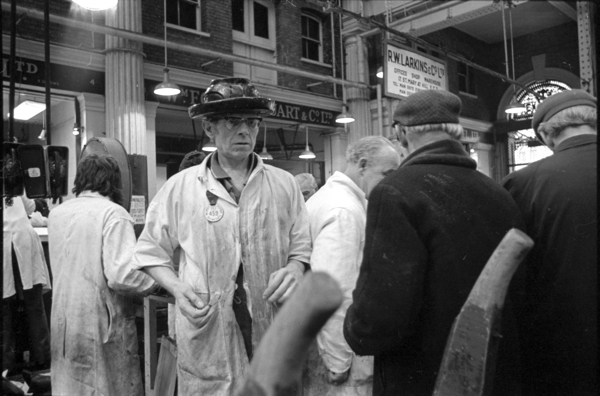 Wonderfully evocative photographs. Thanks so much for sharing. 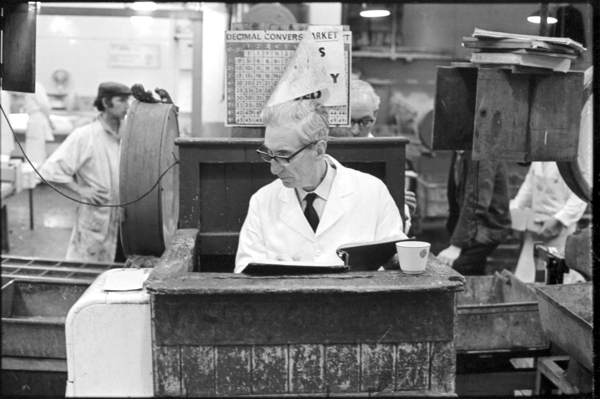 Anyone got any more old pictures from the past 40 years, I started at Grant and Mays salmon company 40 years ago and am still working at the new Billinsgate, albeit a bit older. 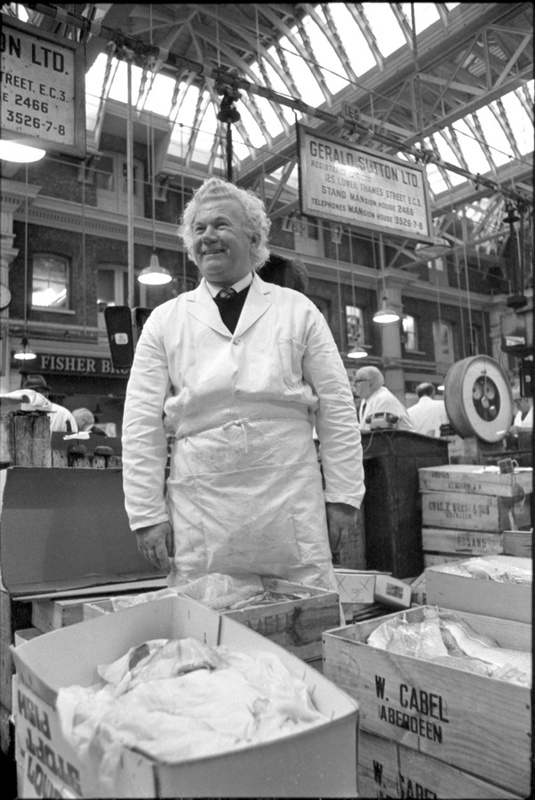 The old fish market in the City was by 1975 a misfit, the hall and its surrounding streets and alleys a reminder of a bygone era. 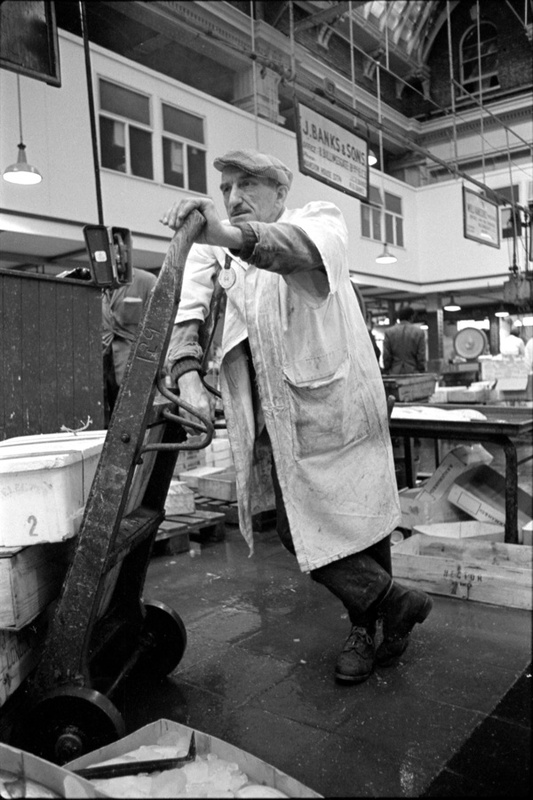 My dad was a porter in the market in the 1960s and 1970s before he went on to run his own retail operation. Its great to see the “Wholesale Only, No Retail Sales” signs on the stands. 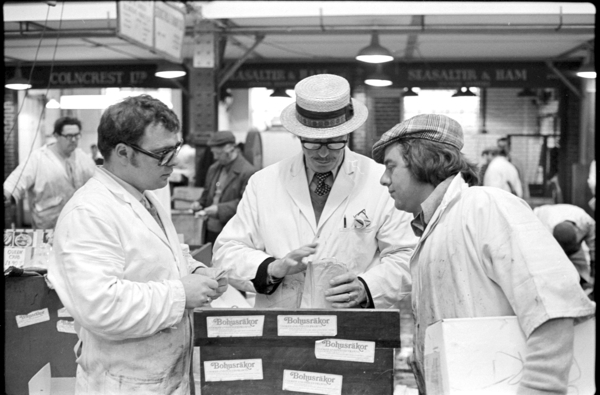 The new market of today is very different, an open market where fishmongers/caterers stand side by side the general public to acquire their supplies. 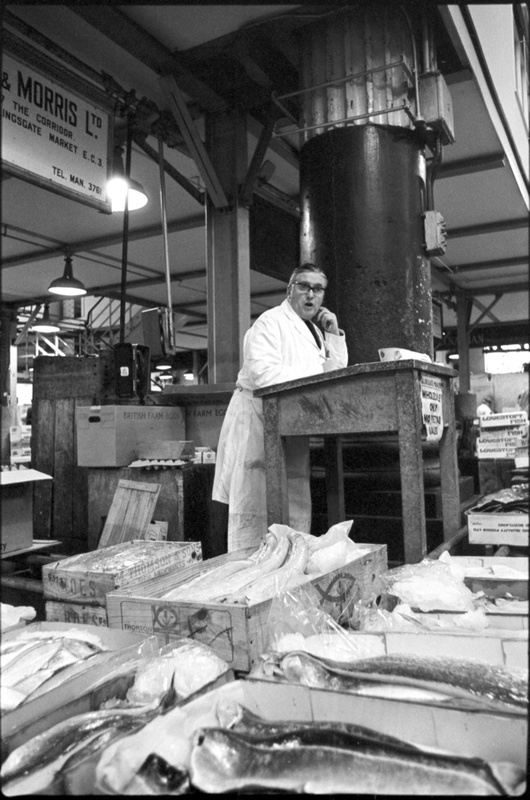 For many fishmongers this killed their trade as many customers in London simply bypassed the high street and went to Billingsgate direct. 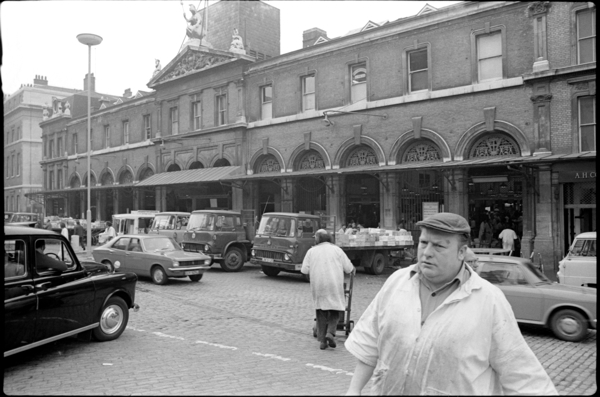 Whilst I am sure the atmosphere of the old market was something to behold, I remenber being there as a kid and remembering how rudimentary the facilities were (the cafe, the pub and toilets!). I now work in London bridge and so walk over the bridge looking down on Lower Thames Street and the old market hall in Billingsgate. The changes to that area are simply mind boggling (4 lane motorway, new offices, etc). 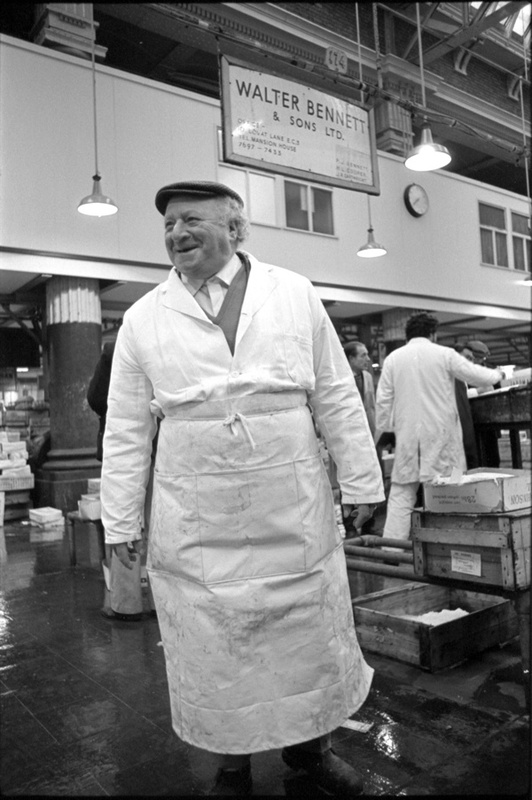 Apart from the old hall and the pub opposite there is no real reminder other than the nearby Fish Street Hill street name that this ocne great market operated in the area. 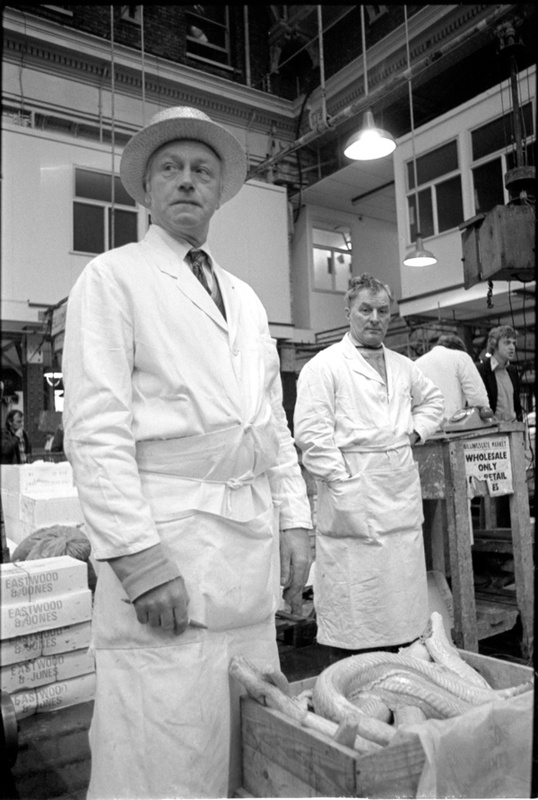 Sooner or later the new market building in the Docklands will be moved – it is slowly being enveloped in by Canary Wharf and the acreage that the market now sits on must be worth hundreds of millions of pounds. 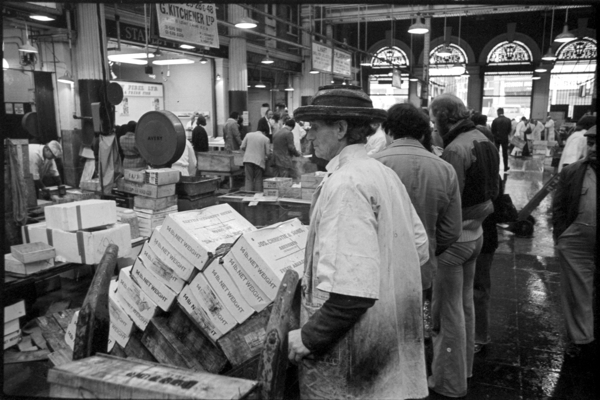 The irony of it all is that in the 1970′s (the market finally moved in January 1982) the decision was made to move the market in response to the fact that the area was changing and being taken over by the needs of the financial district of the City. 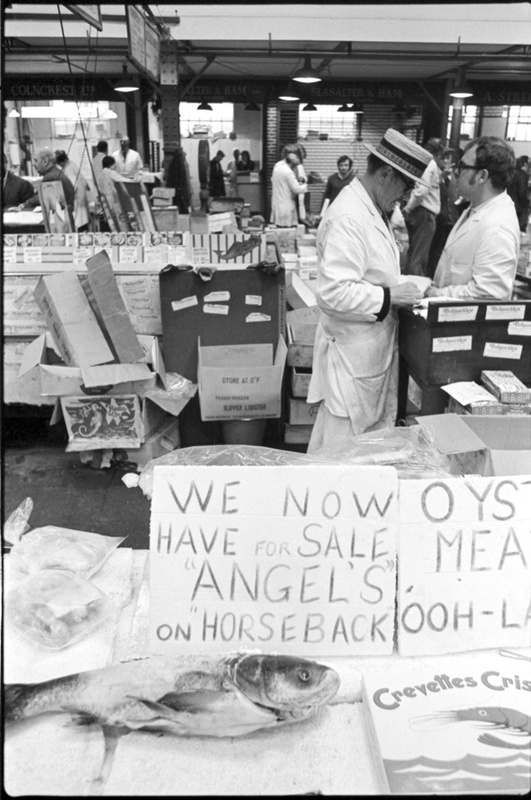 Canary Wharf, and its needs for more finance space, will do the same to the new market some 40 years later…..